The volume concludes with New Directions for Child and Adolescent Development series editor-in-chief Reed W. Larson discussing the challenges reported by youth working on arts, technology, and social justice projects in organized programs and how they learn to address them. This is the 133nd volume of the Jossey-Bass quarterly report series New Directions for Child and Adolescent Development. The mission of this series is to provide scientific and scholarly presentations on cutting edge issues and concepts in the field of child and adolescent development. Each volume focuses on a specific new direction or research topic, and is edited by an expert or experts on that topic. 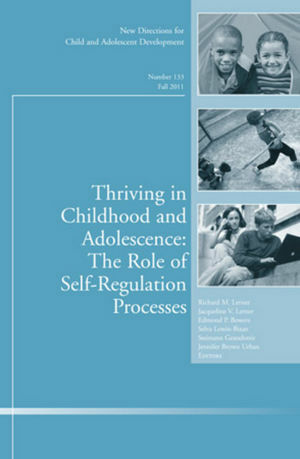 Richard M. Lerner and Jacqueline V. Lerner are the authors of Thriving in Childhood and Adolescence: The Role of Self Regulation Processes: New Directions for Child and Adolescent Development, Number 133, published by Wiley. The editors discuss the need to integrate self-regulation processes and to create a life-span oriented framework of these processes. They provide a brief overview of the work of the scholars contributing to this volume. Vygotsky and Luria's concept of the "extra-cortical organization of higher mental functions" and its evolution are explored using the example of self-regulation. The authors situate self-regulation and social competence in a theoretical context that describes the components most important for early school success. Self-regulation is discussed as a construct that depends on the development of key lower-order components. The conceptualization of selfregulation and its development is applied to other approaches to self-regulation. The positive youth development (PYD) perspective is used to emphasize that enhancing adolescents’ abilities to engage in intentional selfregulatory processes will increase the capacity of youth to thrive. The authors extend the ideas of the development of self-regulation and its impact on development by proposing a life-span, relational, public health model. The author discusses the challenges reported by youth working on arts, technology, and social justice projects in organized programs and how they learn to address them.